When trying to learn Japanese Kanji is always a terrible challenge ! 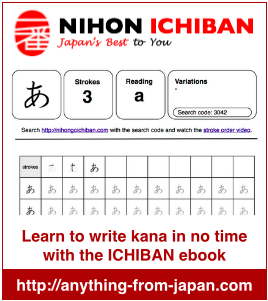 To help all the people wanting to learn Japanese and people who are planning to pass the JLPT N5 Test the NIHON ICHIBAN team created an ebook that you can view and download from here KanjiBookJLPTN5. You can print the Kanji book pages as many times as you want and practice the writing ! Most important this ebook has NO COPYRIGHT so you may feel free to use as many times as you want and to SHARE IT with whoever you want! How can I get this? I followed the instructions in that page but I didn’t receive anything. Can you send it to my email? We now processes all orders and you should have received the link by now. Please let us know if you still have a problem. you can just download it from the link on this page. I did that. A, it’s ok now. Thank you. ganbatte ne. for your JLPT N5. thanks!!! this is really helpful!! Thank you very much. I could download it and for sure it is very useful for beginners. Great job! than k u very much ..gbu! how could i download this?? Just click on the picture of the worksheet and the download will start. It might take a minute or two depending on your bandwidth. I also click on the link and it’s already downloaded but there seems to be no content when I clicked on it? Any help with this? If you click on one of the page image or the link KanjiBookJLPTN5 in the first paragraph, a PDF file should open in your browser and you only have to save it then! It seems to be working fine, I hope you can download it now. thanks a lot for this , i really appreciate it. really helpfull. maybe next time i can download grammar test for any level. Thanks ! Your twiiter message brought me here. Currently, studying kanji. Feel free to visit my blog, Anicoma Diary if you’re into japanese culture like anime, cosplay & manga. Again, thanks d! Thanks for visiting out site. I hope it will be helpful for your kanji study. You blog looks nice. It if a free service and it helps making your blog known. Do you have kanji books for n1 or n2 level? Sorry but we don’t, and we are not sure if that would really make sense considering the enormous effort required to prepare that book. We check the link and it seems to be working well thus in order to avoid having more and more individual request could you please try once more? Can you also have N4 test like this? Thanks for your comment. We are very happy to hear that the book was helpful to you. As for JLPT N4 – we are not yet sure if we will create a workbook for this one too, yet. Just wondering how many people might need it. we need it!! n4 too.. Your site is great! Thanks a bunch for all the helpful material! Thank you so much. I am studying for my JLPT N5 now and this will be a huge help since I am self learning!! arigatou gozaimasu. . . . .
How much of the kanji details do we need to know for the test? Do we NEED to know everything like: both pronunciations, radicals, vocabulary it’s used in, etc.? i am learning japanese languse.so i need a kanji practice book please tell me where it available..
konbanwa, how can i get this ebook? because I’ve followed the way, but it still can not. Is the Kanji exercise book for JLPT N4 available? ?